For various reasons, Valerie Safran and Marcie Turney decided to close Bindi, their indian restaurant. I’d never had a chance to go, so we stopped by on their last day in business. I’m happy to say that it was full and hopping. It was a beautiful space! And all of the food was delicious. It’s a shame to see it go! 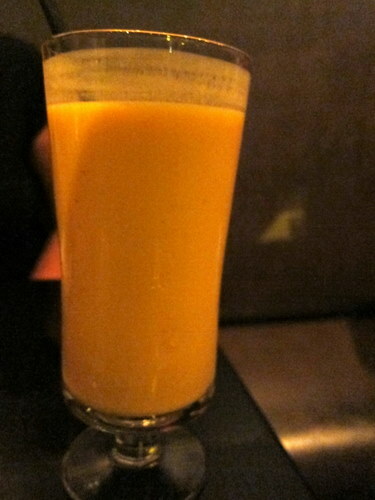 E’s mango lassi. Who doesn’t like mango lassi? 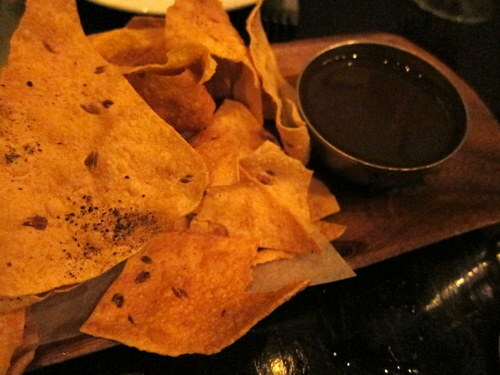 Papadum with chutney for dipping. You know, it’s like the chips and salsa of indian food. I love this stuff. We both ended up getting their prix-fixe, which has a limited menu, but pretty much covers most things from their regular menu. It’s not necessarily a better deal or anything, but I’ve just been into prix fixes lately. 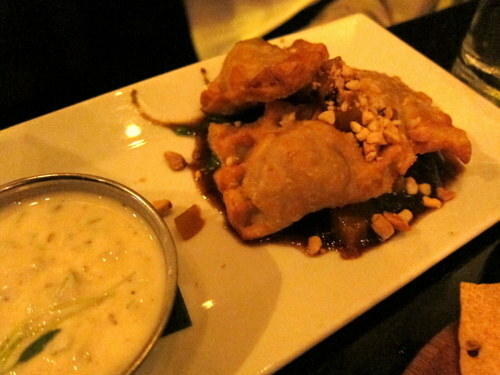 Here’s E’s spring pea and potato samosas, served with mango-date chutney and raita. These are adorably hot, flaky, and not greasy. I got the salt roasted beet and mixed radish chaat. 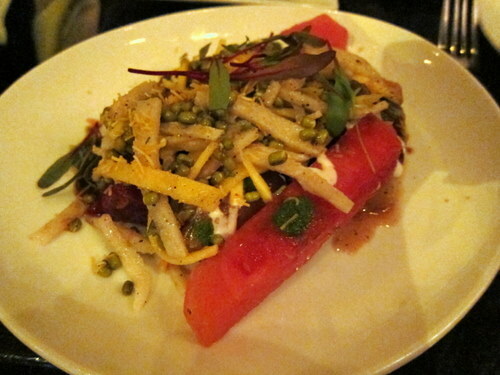 It’s a salad of local beets, watermelon, jicama, chutneys, sprouted moong, and yogurt. This thing was awesome. There are so many different flavors in this, it’s hard to describe. 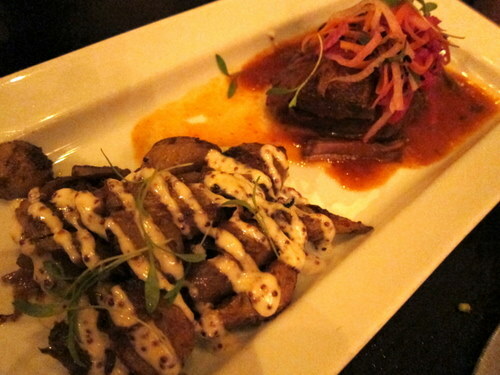 E’s indian bbq braised shortrib with masala roasted potatos, grilled corn-cabbage slaw, and watermelon rind chutney. Bindi’s food is interesting because it doesn’t always look typically indian, and then you taste the intense indian flavors. 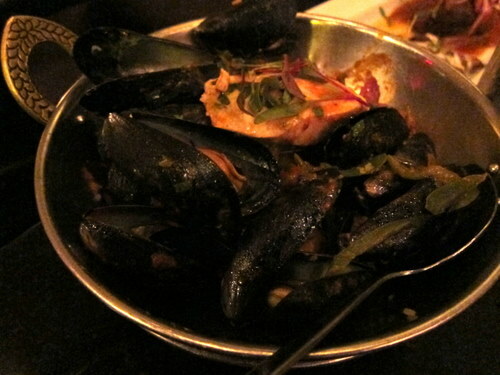 I got the seafood goozoo which comes with shrimp, scallops, and mussels in a spicy tomato-tamarind curry, with ginger, garlic, green mango, and lime rice. When I first tasted this, I wondered why this dish was being served at an indian restaurant. Then I moved onto the bottom of the bowl and then all the indian flavors hit me. This had tons of fresh seafood. I really enjoyed this. The bread we got was a potato paratha. 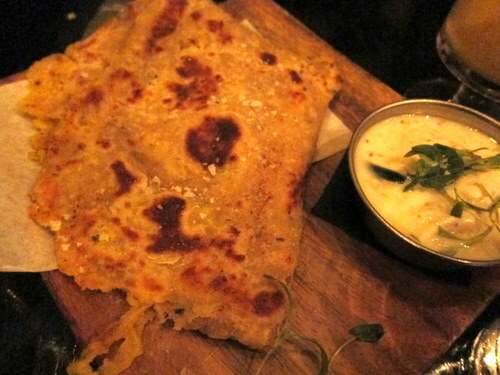 It was a slightly spicy potato griddle bread with ghee, sea salt, and a house raita. I love me some indian breads. They should be part of my daily life. 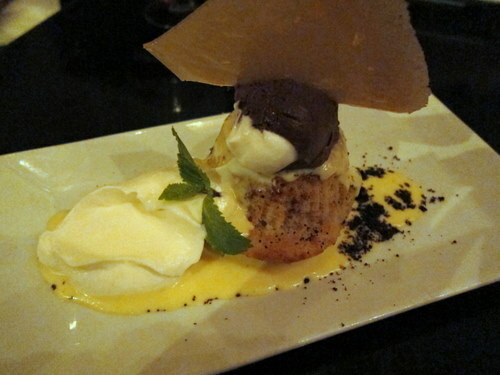 E gushed about the cardamom cake, so that’s what we both went with. It’s an individual sized warm cardamom cake topped with indian spiced chocolate pot de creme, salted caramel, cacao nib crumble, whipped cream, and a giant shard of sugar glass. Man alive, was this thing amazing! If the salted caramel budino is the must-have at barbuzzo, then this is the must-have at bindi. I hope that they end up still serving this at one of their other restaurants. This entire meal was lovely, and so was the service. I’m just happy that I got a chance to check it out! Bindi, we’ll miss you! 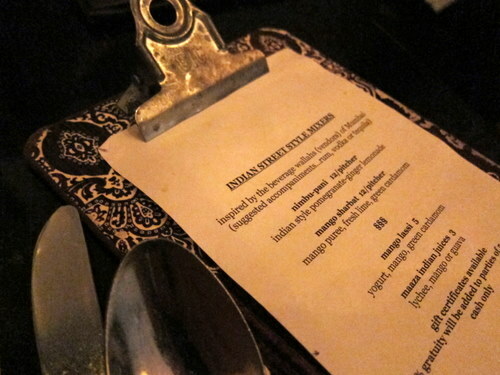 Kind of weird to see short ribs on a Indian menu…everything looks really good, though. Sad to see it closed.